Beat curd & add 2-3 cups of water. then add flour , salt,sugar & mix it well. Heat a pan with oil. add curry leaves, bay leaves , mustard & cumin seeds. let it crackle. Then add ginger-garlic paste & green chilies. now add curd mixture in it & stir it constinuosly & within a 2-3 min remove it from fire. Garnish it with coriander leaves & serve. it can be a good combination with rice also. very tasty. 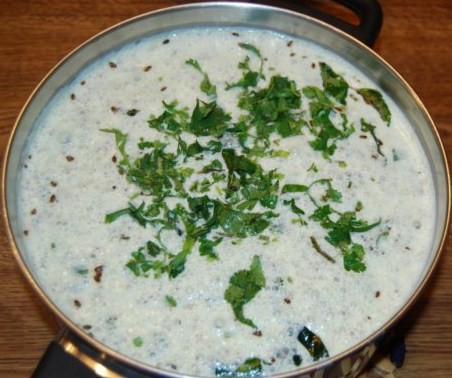 this is the first time iam coming across white kadhi and that too with wheat flour instead of besan. i and my husband liked it very much. Wow!sounds great .This is the first time i have come accross a recipe of KHADHI with wheat flour.My daughter is allergic to Gram flour,as such we refrain from making Khadhis.But I will definitely try this out.THANKS!!!!! !